Light: Exercising authority. Defining limits. Directing the flow of work. Communicating clear guidelines. Being in control of yourself and others. Tempering aggressive masculinity with wisdom and experience. Shadow: Micromanaging. Crushing the creativity of others with a rigid, iron-fisted approach. Insisting on getting your own way. Assuming a dictatorial mindset. Using overt force to achieve your goals and maintain order. Mythical/Spiritual: Masculine gods, including the Hebrew God, the Christian God, Allah, and Zeus. Patriarchs (Abraham) and lawgivers (Moses). Vishnu, the Preserver. Story: A stern figure seeks to control or restrain the main character by reminding him or her of responsibilities and obligations. Relationships. Without becoming false or deceptive, you can regulate your feelings and reactions. Beware the need to always be in control; a healthy relationship incorporates a fair division of labor. Be on the lookout for subtle (and not-so-subtle) efforts to wear the pants in the relationship. Work. Efficient groups depend on centralized control. Seek ways to direct the flow without micromanaging the process. Encourage leaders (including yourself) to step up to the plate and embrace their obligations. Control what you can; don’t worry about the rest. Spirituality. The stereotypical view of religion casts organized faith in restrictive terms. Rather than be constrained by structure, consider how structure and discipline might enhance your spiritual experience. Seek guidance and direction from those who have walked the path before you. Personal Growth. In what ways do your attitudes toward authority seem to be shaped by your relationship with your father? A mature person recognizes that structure and authority are a requirement of civilization. Some resist purely out of habit or stubbornness; when you buck the system, be sure you have good reason to do so. Fortune Telling. A father figure arrives. A new employer or authority figure will give you orders. Expect discipline or correction in the near future. The ankh scepter. The Emperor’s distinctive scepter hints at his dominion over life and death. In the Marseilles-style decks, the Emperor holds a standard orb and cross scepter. In your situation, what do you really control? The beard. The Emperor is often drawn with a full beard, suggesting masculinity and maturity. Significantly, many drawings of masculine deities (including the Christian God) incorporate long, flowing beards, emphasizing transcendent authority. Who’s in charge of your situation, and by what authority? The cubic throne. In stark contrast to the Empress’s cushioned throne, the Emperor’s seat often appears to be carved out of a single marble slab, reinforcing his monolithic authority. Would rigid control be more appropriate than gentle guidance today? Fiery surroundings. The Emperor often appears in a blasted desert landscape (suggestive of Mars). Here, the emotional stream that flowed so freely past the Empress is often compressed into a weak, regulated trickle. How might strict emotional control help you now? The ram. 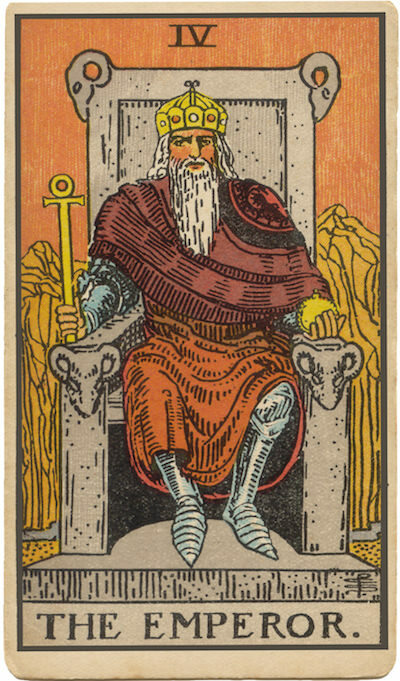 The ram, absent in early versions of the card, suggests the Emperor’s ties to Aries. Traditionally, the ram symbolizes the fiery energy of Aries and, physically, the head of the body. Are your efforts fruitful, or are you just butting your head against a wall? How does the issue of control or regulation impact this situation? What would a compassionate but strict father do?